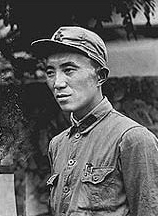 Born May 31 1906 in Sichuan Province and died August 3 1978 in Germany. Luo Ruiqing was dean of studies of the Red Army University. Promoted to General of the Army in 1955 (Equivalent to 4 Stars). Luo Ruiqing was then member of the Secretariat of the Central Committee, Secretary-General of its Military Commission, Chief of the General Staff of the Chinese People's Liberation Army and Vice-Premier of the State Council. 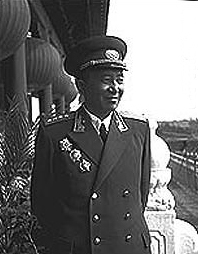 A General Office for Defense Industry was set up under Senior General Luo Ruiqing in November 1961. Luo Ruiqin was conferred the rank of army general in 1955. Luo Ruiqin, dean of studies of the Red Army University. 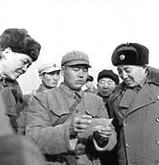 Luo Ruiqin(left) was briefing Mao Zedong on the performance of semi-automatic rifle made in China. An on-site meeting was held to popularize Guo Xingfu's training method at a place in the East China Region by General Staff Headquarters in January 1964. In the picture Luo Ruiqin(right) chated with Guo Xingfu. 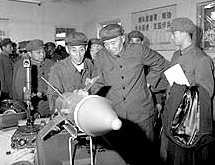 In September 1977, Luo Ruiqin (second from right ) was inspecting a prototype of anti-tank missile at a shooting range in Beijing suburb.